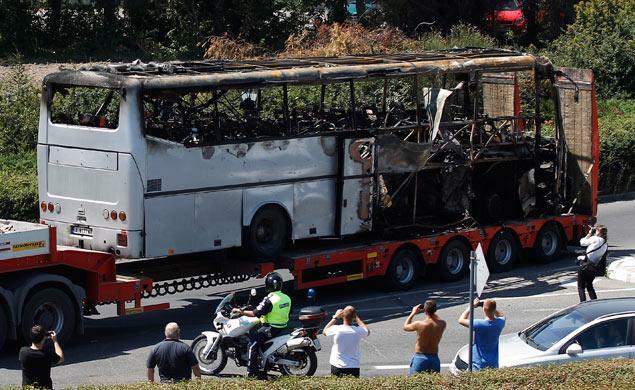 The bus bombing that killed five Israelis and a driver in Burgas, Bulgaria, last year was most likely the work of Lebanon’s Hezbollah militants, Bulgarian officials say. The attack, in the Black Sea resort of Burgas in July 2012, was carried out by a bomber who died at the scene. A six-month probe uncovered “obvious links” to Lebanon and Hezbollah, prompting criticism from Israel’s prime minister and a top US official. Israel has always blamed Hezbollah – and Iran – for the bombing. Iran has steadfastly denied any involvement, while Hezbollah has made no comment. Unveiling the results of the six-month inquiry in Sofia on Tuesday, Interior Minister Tsvetan Tsvetanov said two suspects holding Australian and Canadian passport-holders were directly linked to Hezbollah. “We have established that the two were members of the militant wing of Hezbollah,” he said. The pair had lived in Lebanon since 2006 and 2010 respectively, the AFP news agency quoted Tsvetan Tsvetanov as saying. Israeli Prime Minister Benjamin Netanyahu said the Bulgarian findings made it clear that Hezbollah was “directly responsible for the heinous act in Burgas”. He said Hezbollah and Iran were “waging a global terror campaign across borders and continents” and urged European nations to “reach the required conclusions regarding the true nature of Hezbollah”. Until now, Europe has refused to follow the US lead and label Hezbollah a terrorist organization. The US stopped short of asking Europe to put Hezbollah on its terror list, but counter-terrorism chief John Brennan issued a strongly worded statement. The group poses “a real and growing threat not only to Europe, but to the rest of the world,” John Brennan said. Europe and the world should seek “to disrupt the group’s financing schemes and operational networks in order to prevent future attacks”, he added. Before publishing its report, Bulgaria had avoided making public any suspicions about who was behind the Burgas attack. Initial investigations – including the discovery of the bomber’s head at the scene of the attack – suggested the strike may have been a suicide bombing. But officials now believe the device may have been remote-controlled, or accidentally detonated by the bomber. In The Hague, the director of Europol, which co-ordinates policing across the 27 European Union states, said he backed the Bulgarians’ conclusions that Hezbollah was involved. “From what I’ve seen… obvious links to Lebanon, from the modus operandi of the terrorist attack, from other intelligence that we see, I think that’s a reasonable assumption,” Rob Wainwright told the Associated Press. If Hezbollah’s involvement was proven, it would be the group’s first successful terror attack in Europe since the mid-1980s, he said. In the wake of the bombing, Bulgaria’s prime minister said there was “no chance” of detecting the group’s activities before the attack. A photofit of the suspected bomber was released, but few details were known about his identity. But an intensive police probe, with 50 officers deployed to Bulgaria by Europol, now appears to have led investigators to Hezbollah.